Archaeologist Cédric Gobeil discusses how he used modern imaging technology to find dozens of animals tattooed on the mummy of an Egyptian woman, probably a priestess of Hathor. 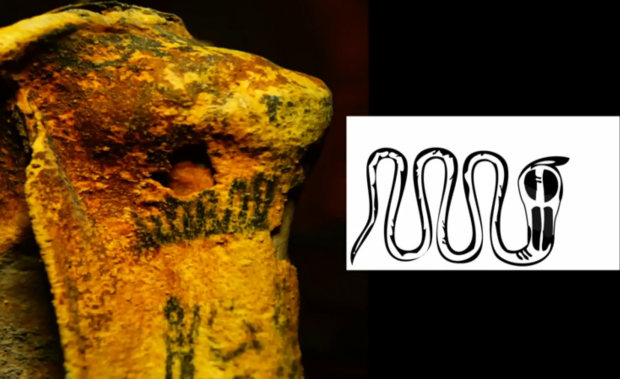 She also had a hieroglyphic neck tattoo that is pretty creepy-looking 3,300 years later. Some parts of the body are so dark and covered in embalming product that it's impossible to see the skin. So using an infrared camera, it sees through layers and sees skin as it was. Ancient Roman texts and sculptures describe a Celtic practice of severing your defeated enemies' heads, embalming them with resin and plant oils, and displaying them as war trophies: now, archaeologists have unearthed evidence of the practice at Le Cailar, the 2,500 year old walled city near the Rhone.